Andrejs Selickis (b. 1960) is a singular, idiosyncratic phenomenon among Latvian composers. As with Arvo Pärt, Selickis’ work is inseparably linked to his faith, which has found a deep and unique expression in his distinct style. His world of sound seems to incorporate codes of holy texts, a higher model of the Universal order and a divine symmetry. Iconic symbolism, sacred archetypes and the ecstatic experience of God’s presence are the keys to his music. Selickis was born in Daugavpils, Latvia. Selickis later attended the Jāzeps Mediņš School of Music in Riga, where he graduated from the music theory class. He received his diploma as a composer in 1986, having studies in Pēteris Plakidis’ class at the Latvian Conservatory. Selickis has worked as an independent artist since graduating from the conservatory. 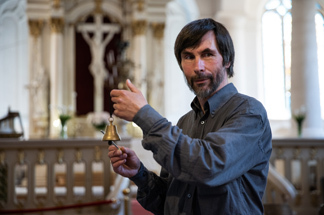 He lives in Riga and serves as a regent, liturgist and psalmist in various congregations of the Church. He also has a master’s degree in theology. Selickis’ music has been increasingly performed in public in recent years. In 2015 he was awarded the Latvian Great Music Award, the highest state honour in music.